Family: Bill Russell; 35 years married and one son, Andy Russell, 28. Subdivision: Chattahoochee Heights neighborhood; one of the first neighborhoods in East Cobb! Current Weight: 125 pounds Weight Lost: 20+ pounds and getting weight and body mass index in the normal range. How long did it take you to lose the weight? Four months. Why You Lost Weight: I decided to make a change and not let age and weight dictate my health. Can you share your biggest challenge? Sticking with a set regime each day and not getting discouraged. How Did You Lose It? I followed a physician-based program with the help of my free health coach and a structured eating plan. I learned that eating six small meals spread throughout the day was better than eating 3 times a day; this helps control cravings. I began balancing carbs and protein for more stable blood sugars and the weight came off. Favorite Healthy Foods: Healthy salads, cauliflower and broccoli. What Keeps You Motivated: Being healthy makes me feel my best, sleep well and helps me lead an optimal life! How Has Your Life Changed? 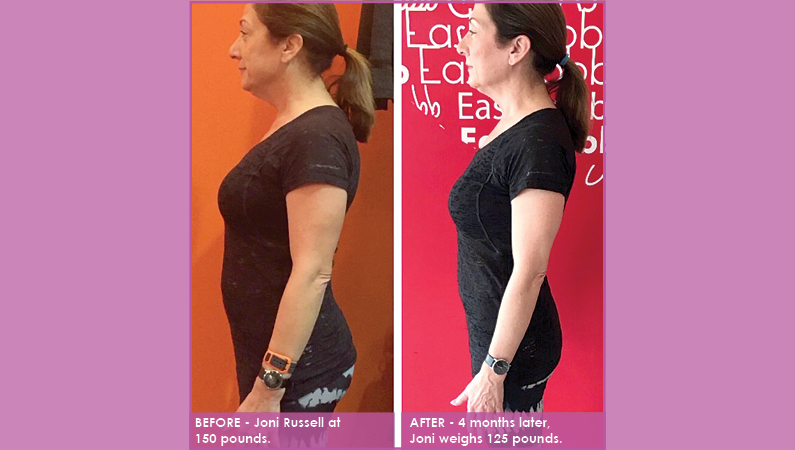 My extra weight is gone, my energy level has increased tremendously and now I coach others through the same program to help them achieve optimal health. I no longer have high cholesterol and my blood sugar is also normal. I feel empowered and no longer controlled by food! Lesson Learned: I learned to change one healthy habit at a time – not just do it all at once! Have you transformed your body? Tell us how you made it happen. We want to hear all the details of your weight loss story. We want to know what led to your weight gain (please be specific), what you consider your turning point, how you lost weight and how long it took you to achieve your feel-great weight. How did you change your eating habits and physical activity? Were there any special diet tricks you used to control cravings, squeeze in exercise or meal planning or limit portions? What are your go-to products (think apps, training tools, even food scales) if any, that helped you stay on track? Email us your weight loss success story – along with before and after photos – to cynthia@eastcobber.com.